Known as "Gem Capital of the World"
A SLower Pace of LifeDiscover Us! Franklin, North	Carolina	is	a	classic slice of Small Town America. While we're considered the trade center of far Western North Carolina and home to national technology providers, you'll find our lifestyle is relaxed and so are our people. Friendly smiles and hellos will greet you as walk through our downtown area or along the Little Tennessee River Greenway that runs through the heart of Franklin. Our heritage is showcased in the three museums all located within walking distance of each other on Town Hill. During the Spring and Summer months the Town sponsors Pickin' on the Square with free, live entertainment downtown at the Gazebo on the square. Plus, the Town sponsors and hosts many festivals and events each year. 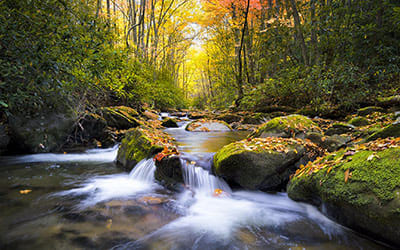 Franklin is nestled in the Nantahala National Forest, the largest National Forest in the State encompassing more than 500,000 acres. The word "Nantahala" is a Cherokee word meaning "Land of the Noonday Sun." The name is appropriate as, in some spots, the sun only reaches the floors of the deep gorges of the national forest when directly overhead at midday. Our location affords residents and visitors an extraordinary outdoor experience from white water rafting and over 600 miles of hiking trails (including the Appalachian Trail and Bartram Trail), to camping, hunting and fishing. Waterfalls dot the landscape and nature paints a color canvas in the Autumn that is magnificent. Franklin is a unique town nestled in the heart of the Blue Ridge Mountains in the foothills of the Great Smokies. The city was named for Jesse Franklin, one of two state commissioners who surveyed and organized the town in 1820 as the county seat for what would become Macon County in 1828. Jesse Franklin served North Carolina as a senator and as its 20th governor. The city of Franklin was not formally incorporated until 1855. An ancient Indian Mound located in the heart of town, called Nikwasi or "center of activity" serves as a reminder of an earlier time when the Cherokee lived in and around what is now called Franklin. Streets with names like Wayah, Ulco, Iotla and Watauga reflect or Cherokee heritage. Franklin is also known for its Scottish Heritage and the Scots rapor with the Cherokee Indian Nation. North Carolina has more people with Celtic heritage than any place in the world, including Scotland. Franklin is home to approximately 3,900 citizens, but the population nearly doubles during the spring, summer and fall seasons due to our temperate climate and beautiful scenery. Our geographical position enables us to enjoy cool summer nights and mild winters. With a healthy tourism industry and lots of local people taking an active role in the community, there are always exciting activities and places to go. Evidence of the bustling community's growth is found in the census figures. In 1890 the population was only 281, now it is 3,989. Census figures for each decade show a steady increase. Franklin is fast becoming a choice retirement place with a summer population increasing to double the number of year round residents. Today, the Town of Franklin is recognized as the trade center of Southwestern North Carolina. Several old established businesses plus many new ones supply the home builders' needs from foundation to finish. Tourism also plays a large role in the economy of Franklin in providing an outlet for the many beautiful handmade crafts created by the natives and the newcomers. Franklin's medical, educational and recreational facilities are outstanding. The beauty of the mountains, lakes and valleys attracts thousands of visitors, in search of a slower pace of life, each year to our small mountain town. Franklin is governed by a Manager / Council form of government. Elections are held bi-annually to elect the Mayor and three of the six Aldermen. Aldermen run for terms of four years. A staff of 66 regular employees provide the services of police & fire protection, water, street maintenance, sewer and administrative work. Fire protection is provided by a dedicated group of 30 volunteer firemen and 3 full-time paid staff. The key to the success and peaceful atmosphere that prevail in this small town are our people who are hardworking, God fearing, loyal citizens that call Franklin home.